Update January, 2015: A newer post has been created with links to the songs listed below. You can download these free pdf tabs at Judy RobinsonDesigns and read about how I have now scanned most of the book and made it available. Spring is here. And Spring cleaning. After watching a horrific version of “Hoarders” the other night (it always motivates me to clean something) I decided to embark on Spring cleaning. In the process, I was delighted to rediscover one of my treasures. I’ve written about Bailey and Awai’s 1916 book in 2010 (Pick Waltz tab) and 2011 (Melody in F tab) so I won’t repeat telling you about my initial joy when I first found the book. There is some delight in re-finding it now. In gingerly flipping (it’s very old and crackling apart) through this little treasure, I saw the term “muffled” and wondered exactly how often do you hear that word these days? You will enjoy reading the instructions on playing muffled, in part because the instructions seem so formal. 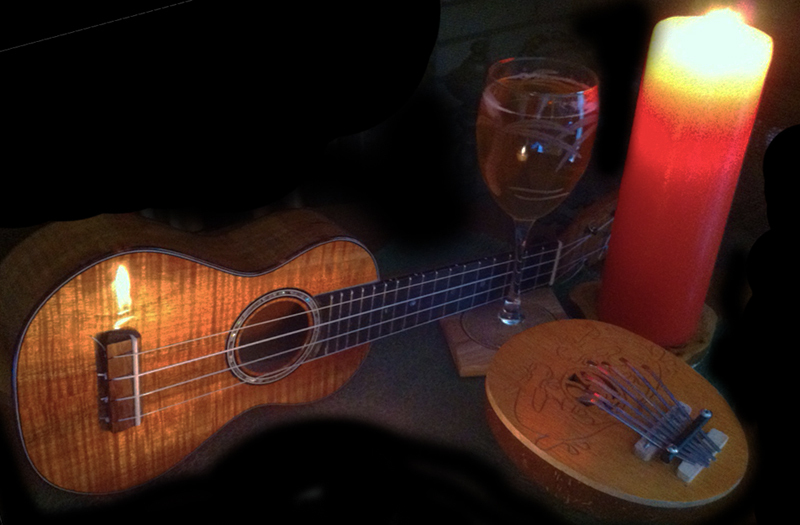 For Earth Hour 2012, vow to play your ukulele by candlelight. From 8:30 – 9:30 switch off your lights and be part of the movement. The world will be a better place if we can recognize they symbolic importance of Earth hour which you can learn more about from WWF’s official video. In the meantime, the Twitterfeed for earth hour is posting minute by minute pictures of cities being part of earth hour. Hope you had a good Valentine’s Day yesterday. Valentine’s Day led me to think about how to draw those we love into our love of playing the ukulele. You know, warm fuzzy inclusiveness. Now your loved one may not want to play the ukulele. But he/she/they could play another instrument. Like the xylophone — an instrument that’s been around forever. Yes, I am still enraptured by the xylophone and ukulele from the wilds of the previous post. While I haven’t made my own travel wood xylophone (stay tuned you’ll be the first to know), I’ve been looking for ideas. Check these out. How exhilarating! Combining three loves — hiking, playing the ukulele and multimedia! The story of multimedia artists hiking 222 miles of the John Muir trail resulted in a variety of interesting great stories. 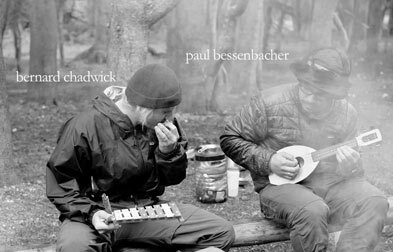 But the post I love the most: “The Ukulele Collaboration on the John Muir Trail“. First, imagine the dedication to carry your ukulele flea 222 miles as Paul Bessenbacher did. And a xylophone (Bernard Chadwick) — now there’s a unique instrument on the trail. The post starts off with a great quote from John Muir and sets the tone for a great read and video. If you do nothing more, watch the video and realize this was no casual stroll over the earth. JMT Campfire Performance from The Muir Project on Vimeo. If you’re not a superbowl fan then you need to pick up your uke and play. I felt somewhat cheated by CNN’s use of Jake Shimabukuro’s “adz” and superbowl in a headline to get my attention about the ukulele. So I tried it to see what itz all about. Better to make time for playing the ukulele. It’s likely to change your outlook on things more than the superbowl. Here’s a contest to get you picking up your uke and doing some serious practice. You could be the opener for Jake Shimabukuro for his documentary release (click this link for details). You have to play a Jake song, and maybe that’s why you can sign up for his “First ever Ukulele Transcription Book” to be released on Feb. 7. SOON! Check it out. You may be the one! Few words are needed for the Hawaii chair. It would have been even better to let the ukulele play through the whole infomercial. But I’d not seen this before. If you haven’t, you need to know such things are out there. Fretboard Journal interviews Mya-Moe ukuleles on their last podcast. I met Mya-Moe (Char & Gordon) at the 2009 Ukefest in Portland. They were just starting out and had several ukuleles they let people play in the classes. The business has really taken off in a good direction for them. Congrats. The interesting news, if you listen to Fretboard’s podcast, is Aaron Keim is going to move to Washington to work with the Mya-Moe duo. He has been working as part of the team from Colorado. I wonder what new variations on the ukulele they will devise. Be sure to leave your ukulele by the tree on Christmas Eve so Santa can play a tune or two. It’s surely a fairly stressful journey with a sleigh full of toys — maybe even some ukuleles for good girls and boys. By leaving your ukulele by the tree, you help Santa de-stress and keep his jovial attitude for the remainder of his journey. Of course, leave the milk and cookies too, because he’ll likely take a nip or sip between stanzas. You may have noticed that if you leave your ukulele out in plain sight that it is more likely many can enjoy playing it. You, yourself, may pick up your ukulele and strum a Christmas tune and notice how it gets you in the spirit. Silent night can calm amid the stress whether you strum it, or learn to fingerpick it. Or maybe “Rockin Around the Christmas Tree” will liven everyone up. If you yearn for snow (the light fluffy stuff — not the storm stuff) you could invoke a light sprinkling with “White Christmas“. In any event, a ukulele in plain sight is fair game for anyone to play. As you can see from the photo even the smallest of elves can become a uke-elf. This is a phenomenon that Kristen (thanks for the photo) captured when Charlie left his ukulele in the kitchen. Elves are quick little folk so this was a rare capture. Kristen was likely very quick with her camera when she heard the music. But it is a great moment of uke elf music. Be sure to leave your ukulele out of its case this Christmas. Christmas Eve you could leave it for Santa, but Christmas Day be sure to strum at least one tune of thankfulness for the simple joy that four strings can bring. This too, is what it is to have a Ukulele Perspective. Brian Chan’s folding ukulele is a work of art. Much the same as transformers were. And origami, Brian’s ‘also’ fascination. The number of intricately designed pieces — flat bamboo plywood — needed to make his folding ukulele must be incredible. I’d like to know how many pieces. Seeing the tuners on the soprano ukulele as two pieces of the bamboo plywood makes me think there are thousands of pieces in this construction. Let me digress about my jaw-dropping amazement with meeting people who make musical instruments who do not actually play them — or even play at them. I think Brian does play some musical instruments because he alludes to such and we need to take him at his word, but he does get his friend to demonstrate how to play his new ukulele rather than strum a simple song himself. So does he play the ukulele? Recently, I met someone who made a beautiful ukulele — it was beautiful because the wood had amazing character to it. The sound was ok but I didn’t get to make much sound because it actually hurt to play. The fret ends were sharp, pointed, slicing. As you slid your hand from a C chord up the neck, you were certain the inside of your fingers would slice open and blood would spurt onto the beautiful wood craftsmanship. Yes, it hurt that much. If you play and make ukuleles, you know you need to file and finish those fret ends carefully — often one by one. Yes, it is time-consuming, but (need I state it?) crafting a ukulele does take time. Which brings me to the selection of material for making ukuleles. Plywood is not a resonant material. Bamboo plywood is strong and cheap, but again, not particularly resonant. Cherry, walnut, mahogany make wonderful backs for ukuleles. For clarity of sound, spruce makes a beautiful tonewood for ukuleles. Koa is beautiful in tone, vibration and aesthetics. My challenge to Brian Chan would be to create the pieces of his ukulele out of mahogany rather than bamboo plywood. The ukulele is not about space so much as it is vibration. For tonal quality that will strike a chord in the hearts of ukulele enthusiasts, it matters what your uke is made of. Thankfulness doesn’t need to be reserved for Thanksgiving Day. Happy belated one to you. If you are here, I want to remind you how lucky we are to have the gift of ukulele and the desire to learn it. If you’ve not seen this film, it’s worth taking the 12 minutes. Don’t get thrown by the title “The Necktie.” The movie will remind you that playing the ukulele gives you what few other instruments can give you — a ukulele perspective — good for yours and others’ health.